Coat chicken thighs in salt and paprika. Heat small amount of olive oil in a large dutch oven and brown chicken thighs until golden. Put aside on a plate, in the oven to keep warm (low heat 200). Add shallot to the same pot, stir and cook until slightly soft, about 5 minutes. Add carrots, zucchini and green beans, stir and cook about 5 minutes. Add 2 cups of the stock along with the chick peas. Low heat to a simmer and cook. Stirring occasionally. Cook the couscous using the leftover 2 cups of stock instead of water. 10 minutes before serving add the tomato and the chicken thighs to the veggie mixture. Pour any juices that were left from the chicken thighs into the pot. 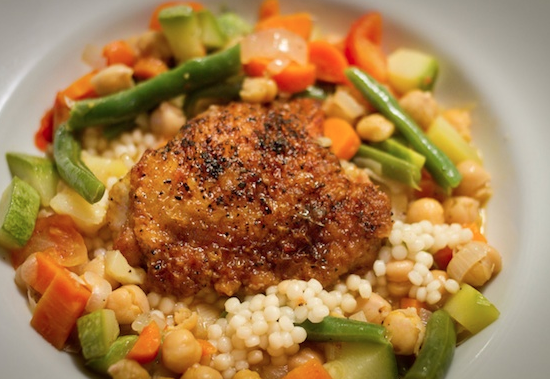 Serve on a bed of couscous. Serve with Harissa.